Whether you’ve fully embraced the digital era or not, as a writer you have plenty to gain from it. Sometimes it’s just a matter of knowing where to look. Fret not: your hardbound books and loose-leaf paper are not under threat. But there’s simply no use clinging to the past when there’s a glut of free resources available to writers at the click of a button. 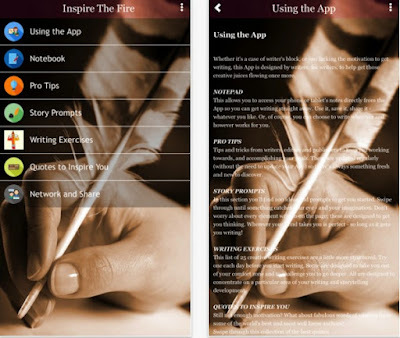 Why not use an app to help you develop and improve your writing and storytelling skills? How to find the right app to help you with that? We found a great app for writing purposes that could help you a lot with your writing – Inspire the Fire. This app, created from writers for writers, developed for IOS users is certainly an amazing tool to inspire and motivate every writer. If you look for inspiration, ideas, or you just have a writer’s block, then you certainly should try this app. With many options and suggestions to help the users develop their skills and improve their writing process, this app is a great choice for giving your writing a push and take your skills to the next level. Easy to use and simply created, yet a powerful tool to inspire writers and help them with any kind of issue they have with their storytelling skills. With 100 writing prompts and 25 writing exercises, this app focuses on every writing area that the writer needs to be improved. The users can swipe through a great catalogue full of quotes from famous writers and get pro-tips from the app that are updated by the latest trends in the writing industry, giving them the newest information about publishers, editors, and authors. You can also choose to share your writing with other users on this app and download it immediately from the App Store’s link below.